Make the most of your stay in Croatia, by discovering the fabulous Bijela Uvala campsite! This 4 star campsite welcomes you for a lively and active holiday. Away from the hustle and bustle of the city, this site, located near numerous beaches is a perfect base for all types of water sports. 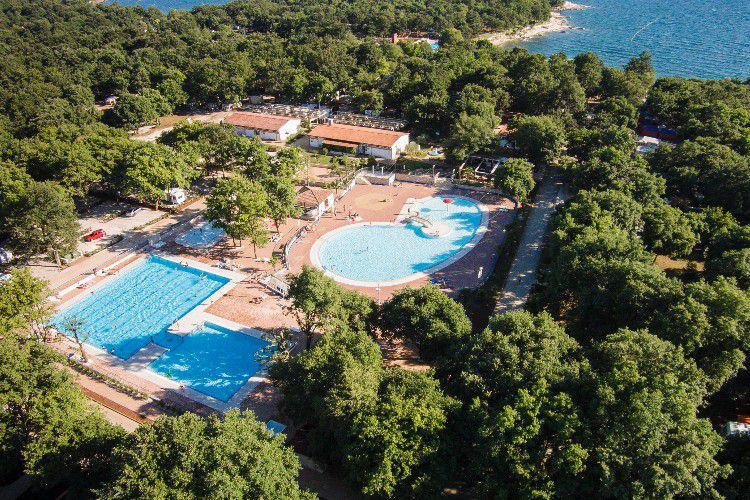 The Bijela Uvala campsite is just 5 km from the center of Porec, in Istria. Enjoy the numerous leisure activities offered on site! This site guarantees a relaxing and cheerful holiday. Enjoy swimming in the on-site water area, sunbathing in the sunshine at the beach, playing beach volleyball, horse riding, biking in the countryside, or discovering windsurfing, etc. Between the kids' club activities, special events for children, muscle toning, sports competitions (football, beach volleyball, etc.) and various recreational activities, the Bijela Uvala campsite is perfcet for the whole family. The Bijela Uvala campsite offers services worthy of its 4 star rating for your convenience. Among other convenient on site facilities, there is a supermarket, WIFI access and a souvenir shop. Pazin railway station (33 km). 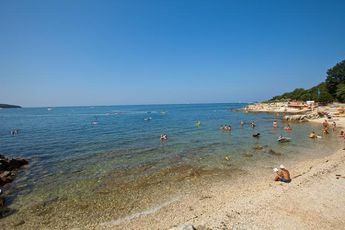 Nearest town : Porec (5 km). At the heart of Istria's west coast, Porec is a must. The site remains authentic, with its surrounding nature and rich heritage. The old town reflects the history of the region, evangelised very early on by the first Christians. The Euphrasian Basilica, built in the fifth century by Bishop Euphrasius, juxtaposes Roman and Byzantine art. Look up as you walk on the Decumanus, the main thoroughfare since Roman times, and admire the tenth century Gothic palaces. Also enjoy the architecture influenced by ancient Rome and medieval Venice. You can then visit the other historical city, Pula, famous for its amphitheater, its fortress and Franciscan monastery. After these urban pleasures, set sail for the archipelago of Brijuni, a group of natural islands. To the east, the Gulf of Kvarner will charm you with its beautiful islands: Krk, Cres, Rab, Losinj, etc. Once your tour is over, head for the delights of Dalmatia, look out for the Croatian gems of Zadar, Sibenik, Split and Dubrovnik. Why not have a change of landscape by heading inland? This is where you will find Zagreb, Croatia's capital. Further north, turn towards Slovenia to admire mountains, caves and lakes of rare purity. If you go up the coast to the north, you can enjoy a trip to Italy: Venice is three hours away, but when you love something, you lose track of time!